Hip bursitis is an inflammation of one of the two major hip bursae. Noninfectious condition (aseptic bursitis) caused by inflammation resulting from overuse, local soft tissue trauma or strain injury. On rare occasions, the hip bursa can become infected with bacteria. This condition is called septic bursitis. Although uncommon, the hip bursa can become inflamed by crystals that deposit there from gout. The most common hip bursitis is an inflammation of the trochanteric bursa, between the trochanter major and the tendons of the muscles gluteus medius and minimus. 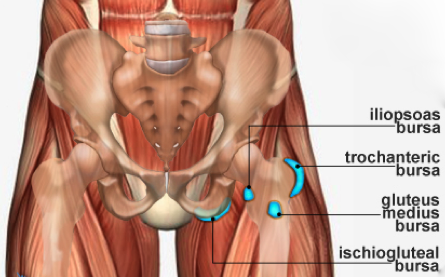 The symptoms are pain in the hip region on walking, and tenderness over the trochanter, which may result in the inability to lie in comfort on the affected side. An X-ray is often obtained to ensure there are no bone spurs or calcifications that could be contributing to the problem. Occasionally an MRI is indicated, if the diagnosis is unclear, or if the problem does not resolve with treatment. Treatment of noninfectious bursitis includes rest, ice, and medications for inflammation and pain. Massage therapy to relieve the muscles gluteus medius and minimus. Infectious bursitis (uncommon) is treated with antibiotics, aspiration, and surgery. Bursitis of the hip is the most common cause of hip pain. Ischial bursitis is inflammation of the bursa that separates the gluteus maximus muscle from the ischial tuberosity, the seat bone. The cause for this form of bursitis is usually prolonged sitting on hard surfaces. Symptoms of ischial bursitis include pain, stiffness, and tenderness located in and around the gluteus maximus and the tuber ischiadicum.